Last friday was an incredibly busy day for the team. Directly after lunch an outreach activity, a presentation for the Rocket Science at KTH course to be specific, was planned and immediately after that the team was supposed to demonstrate the functionality of the main electronics in the system as well as the software controlling it. However the day turned out well and in the end at least some of us got to celebrate in the usual way (with beers at the Rocket PUB). A more detailed story from the two events follows below. The presentation for the Rocket Science course has become a tradition, for the second year in row a team from REXUS presented their project at a lecture for the Rocket Science course. Last years presentation, done by LAPLander, led to the recruiting of a number of members to the current SQUID team. The presentation for this year where mainly based on the presentation given to a number of schools earlier in the spring but does now feature a number of videos which has been recorded during the project (many of which are available on youtube). There where about 60 students audience who listened to the presentation which where given by Me (Gustav), David, Mario and Mikko. The presentation where rounded of by a short desciption of the intended experiment for next years REXUS campaign (see earlier post). We where very glad to see such an interested audience and also that so many students seemed interested in taking part of the mentioned experiment for next year. The second event for the day was the demonstration of electronics and software for the project. Mikael Inga form Swedish Space Corporation was visiting us to see the progress of the system. The team had been preparing for this for a long time and was looking forward to show the features of the system. A more detailed blog post featuring the different parts shown will be posted later on by Monica. I my self was very satisfied to see that everything worked as planned and also that Mikael seemed satisfied with the progress. 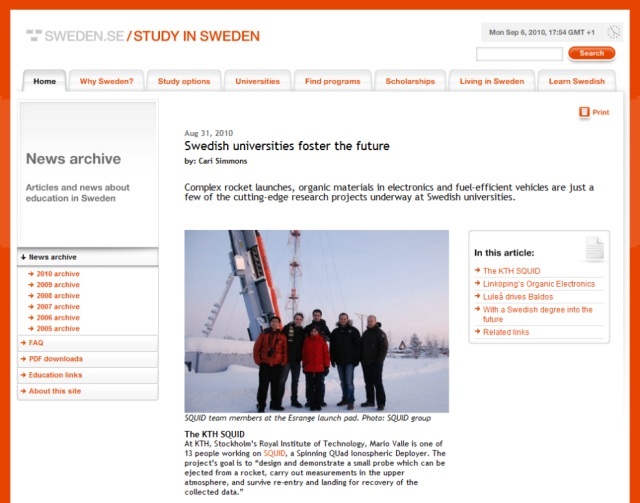 The Division of Space and Plasma Physics at School of Electrical Engineering KTH now aims to put together a team of students to propose an experiment for the REXUS sounding rocket program for university students. If selected the experiment will fly on the REXUS 11/12 sounding rocket from ESRANGE in March 2012. The experiment in mind is a multipoint measurement of mesospheric parameters with a fleet of small subpayloads deployed from the main rocket. The team will consist of 6-8 students and should combine skills in electronics, hardware programming, mechanical design and implementation, signal analysis, system level testing. The first stage is preparation of the proposal to ESA. If selected, the team will work on a detailed design in the winter 2011, and build the payload in spring-summer of 2011. For more information check out the call for students. Also check out the REXUSBEXUS homepage for more information about the REXUS programme. 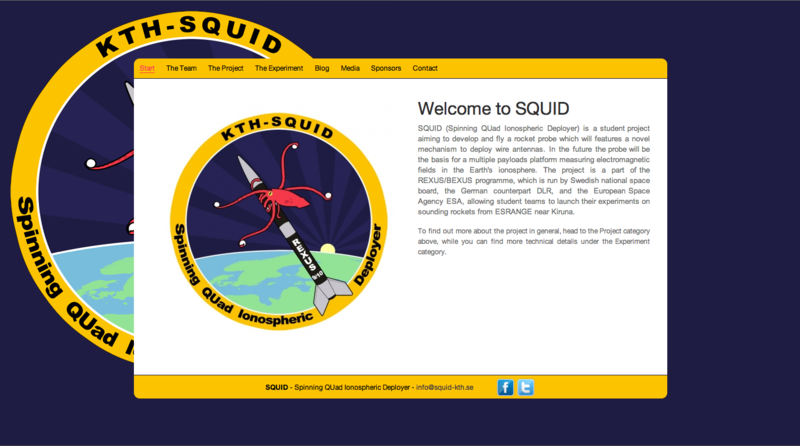 You’re of course also welcome to contact anyone of the SQUID team (or event the LAPLander team) to get more info about what you can anticipate of the programme. Last wednesday we finally had another team night. It was well anticipated since the last one where in early june. We we’re also quite lucky since everyone where able to join. In fact even one of our supervisors, Gunnar, joined us for the night. So what does a rocket probe do for a social event? well in fact we’re quite normal, this time for example it was time for some bowling ant after that a visit ti Hard Rock Café. I think we can say that everyone had a nice night out just check out the pictures! For those of you who has not yet noticed we changed the look on our homepage yesterday night. We’re just now working with updates of the information placed on it and hopefully we’ll be releasing a whole now section on the homepage tomorrow night, more info on this soon. For the moment please take some time and check out the new improved look! SQUID on the official website of Sweden!